Yippi, a global messaging app with an emphasis on thrilling-entertainment and sound-security features, founded by Toga Limited, will be collaborating with AirAsia Badminton Academy, one of the country’s most prestigious badminton training and development centres to nurture and produce world-class badminton players. The AirAsia Badminton Academy was launched in 2012. Since then, the academy has trained more than 300 players and produced world-class badminton players representing the Malaysian team nationally and internationally. Trained by head coach, Rashid Sidek, former national player and World No. 1 badminton champion, the players go through rigorous training and development programmes in their journey towards global recognition. 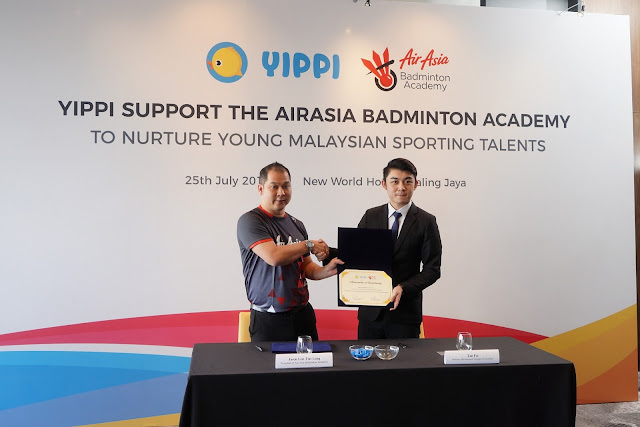 AirAsia Badminton Academy operates three centres: one in the state of Perlis, and two in the Klang Valley which houses 300 players overall, ranging from the junior and the elite teams. AirAsia Badminton Academy will also be adding two more players to their rostrum of talents in the coming months. For more information on the Yippi, kindly visit www.togalimited.com and for more information on AirAsia Badminton Academy, please visit www.facebook.com/airasiabadmintonacademy/. Special thanks to New World Hotel Petaling Jaya as venue sponsors.